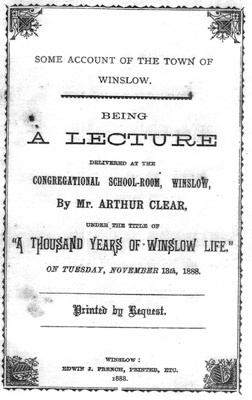 This lecture given by Arthur Clear in 1888 is a shorter version of his book published in 1894. The full text, transcribed by Peter Thornton, is available in .doc format following the layout of the original: Arthur Clear 1888 (231 KB). Or you can follow the links below to read sections of the text in .html format. For more about the author, see Ed Grimsdale's article on Arthur Clear. We have also transcribed a lecture which his son A.J. Clear gave in 1932, whose text was published in the Buckingham Advertiser: Old Winslow.